Gav Thorpe had long been a staple in the novels of the Old World, and now he has made his first full length novel foray into the Age of Sigmar. The Celestial Vindicators and the Knights Excelsior head deep into Ghur to prepare the way for Sigmar's assault on the Allpoints, although their Lord-Celestants don't always agree. So how does the newest addition to the Realmgate Wars novel series fare? 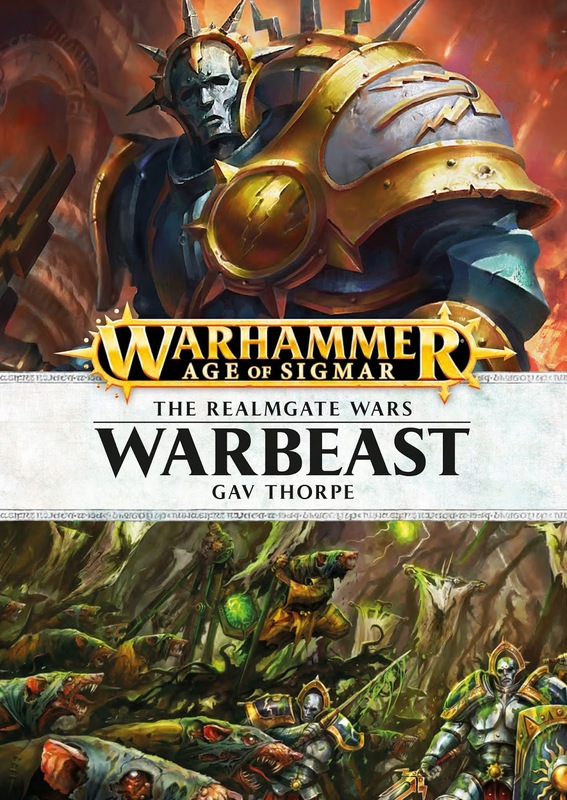 Warbeast is unique in the fact that it's a part of the main novel line, but it's story is not tied into the campaign book. This is the same situation as Hammers of Sigmar and Call of Archaon, and in both of those cases this led to some great stories since it allowed the authors a lot of freedom with the story they wanted to tell. Here we see the same freedom in story telling, following two Lord-Celestants entirely of Gav's creation, Arkas Warbeast and Theuderis Silversword, as they venture into the realm of Ghur. Arkas is the leader of a warrior chamber within the Celestial Vindicators and has the temperament to match his Stormhost's reputation. He is brash and headstrong, and Sigmar knows this. Thrown back into not just the realm he originally hailed from, but the very kingdom and locale he use to call home, Arkas is a force of pure vengeance. He can still remember when he fought the Skaven back when he was a mere mortal, and now coming back to his ancestral lands which are now infested with the ratmen his rage is only intensified. It's an interesting dynamic, and one we have seen before with the Stormcast. By their very nature most of the Stormcast were plucked from battle, usually moments before their death, which means they were about to meet with failure. Now they are given a second chance to redeem themselves and Sigmar uses this to his advantage, knowing that he can get his generals to fight that much harder if he makes it personal for them. Arkas finds himself amongst a band of Bloodbound, whom he promptly slaughters. They were not sent he merely to kill though, and must meet up with a warrior chamber of the Knights Excelsior led by Theurdis. The Warbeasts were meant to act as a distractor, fighting against the bulk of the chaos and Skaven armies while the Silverswords advanced unimpeded. There is a really interesting part where Arkas goes to seek information from a mysterious witch who lives in the mountains of the kingdom of Ursungorod. If you know your Warhammer lore you should catch the nice link to the Old World and a pretty important character from there. I really enjoyed this and I hope the authors continue to put these little nods into the lore we used to know, it helps smooth out the transition a bit and also reinforces the fact that these realms were born from the death of that world. The two are intrinsically linked. Theuderis is the exact opposite of Arkas. He is cool and collected, the master tactician. Unlike his counter part, he was a very successful king during his mortal life, and secured peace and stability from his kingdom. He wasn't plucked from the midst of a battle, but from atop his own castle during peace time for his undeniable leadership abilities. This differing in temperaments leads to an interesting dynamic between the two once they meet up. We get some cool battles against the Bloodbound and the Beastmen early on, but the story really picks up for me once they meet up with some mortal survivors from the realm. Including these very human people in the story goes a long way to making it relatable. It reminds you that the Stormcast are in fact fighting for something more than just land. These chapters are particularly impactful to Arkas too, as they are the descendants of his own people, and his legend has not been forgotten. These are honestly some of my favorite moments from the book and they consist mostly of dialogue. While both of these stories are going on, we also get a few chapters from the Skaven's perspective. They have come into possession of a realmgate that leads to the realm of life, the same one that the Stormcast are looking for in fact. These scenes are a fun break from the Stormcast, and the Skaven are always enjoyable to read about, if nothing else then for the way they speak. The culmination of the novel is as epic as you would expect, but with some pretty imaginative twists that the dynamic of the Stormcasts allow. It's not something I had seen before and it's stuff like this that makes me more and more interested to keep exploring the world of AoS. We get a nice little nod to another one of the new AoS races and another look at what the reforging process costs the Stormcast. The ending was great, the journey to get there was great, honestly the whole book was pretty good. I started off liking Arkas more, but now I'm not sure, Theuderis has grown on me. I hope Gav continues their story, either together or seperately, in future books or stories. Maybe GW will work them into campaign books as well. This book sets itself up nicely for more stories, so lets hope it happens. If you have been reading the Realmgate Wars series, then book six is definitely a good choice to read. It's also a good book for someone who is just jumping into the series now. It has nods and hints at other stories, but for the most part it's entirely self contained. This is the first book that doesn't have an audio version as well, but you can still pick up the eBook or the good old paper version in either a regular hardback or a swanky special edition version.